Boston: Boston Book Arts Group, 1996. Edition of 27. 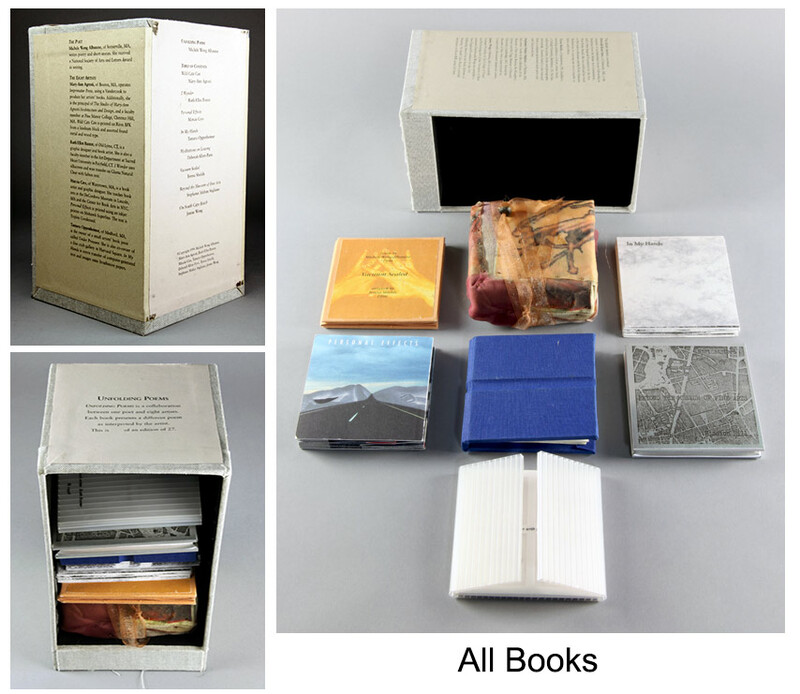 Eight books measuring each 4 x 4" each housed in a linen covered box. 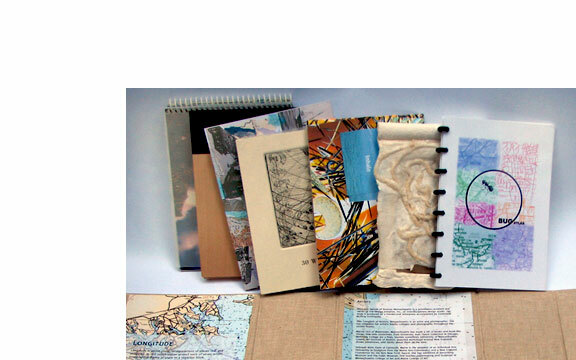 Several techniques were used depending upon the method each book artist chose. These varied from letterpress printing and Xerox transfer to ink-jet, laser, and/or silkscreen printing. 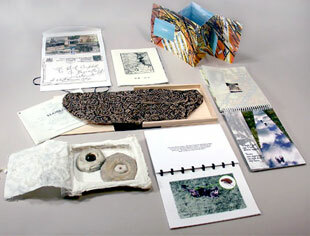 Unfolding Poems is a collaborative series of eight artists books. The poems are all created by one poet. 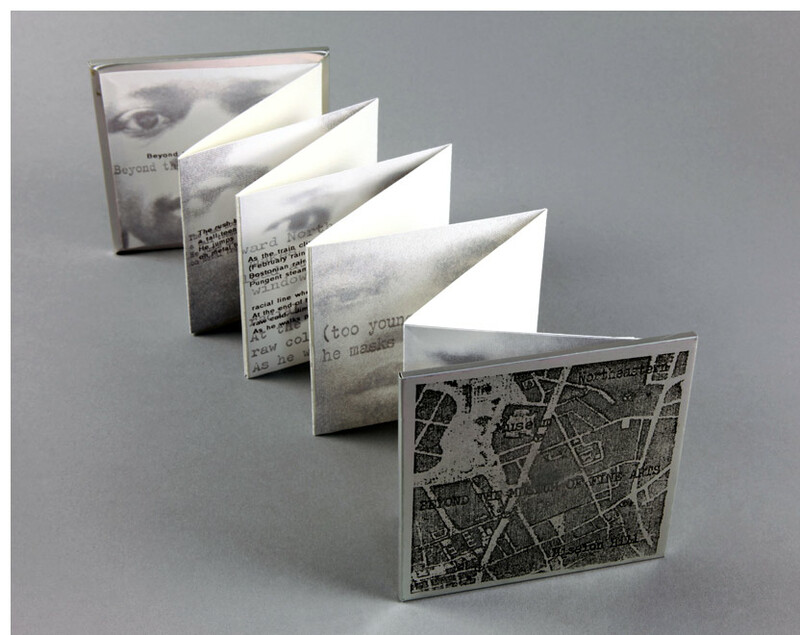 Eight artists created a book that illustrates a poem by Michele Wong. Eight poems by one artist accompanied by eight books – one for each poem. Boston: Mary-Ann Agresti, [n.d.]. No indication of limitation. 6 x 7.4"; 4 pages. 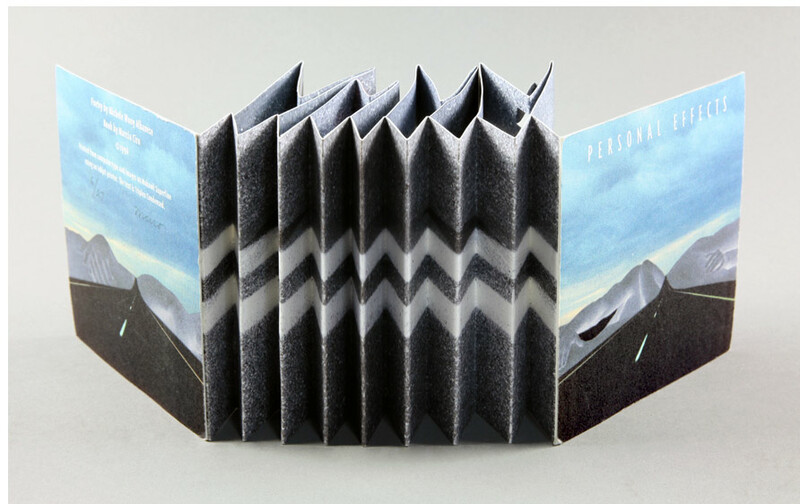 Accordion, folding into itself. Etchings. Printed on a Vandercook letterpress. Boston. Elsa Campbell, . Edition of 40. 5.75 x 7.9"; 16 pages. 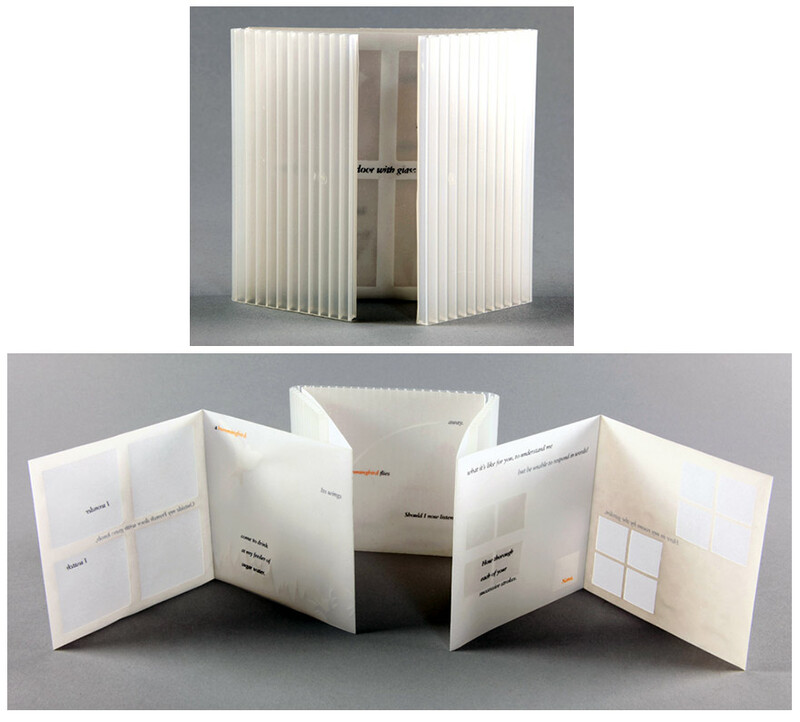 Double sided vertical fold accordion. Laser printed with archival inks using Attic and Centaur typeface on Mohawk superfine paper. Tipped in illustrated paper wraps with slot and paper slip closure. Designed to resemble a souvenir folded post card set. Images of Scotland on one side with journal entries of Campbell's grandfather nd then her own thoughts. Elsa Campbell: "My formal training is as a traditional black & white photographer. 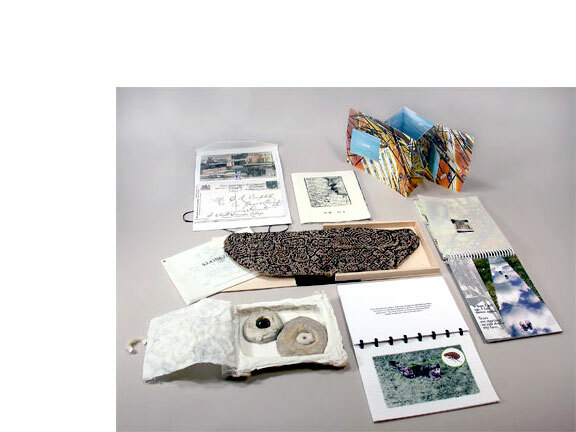 I then began making artist books and collages 15 years ago." Watertown, Massachusetts: Marcia Ciro, 2000. No indication of limitation. 4 x 6" closed; 6 x 15" open. 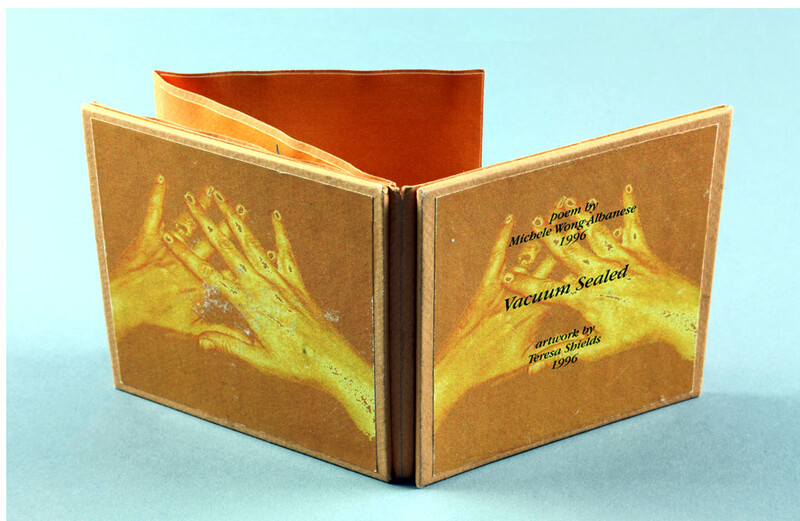 A double-sided accordion with an open interior containing original photographs, illustrations, and text printed with archival inkjet inks on Red river paper. Housed in a transparent wrapper. Marcia Ciro: "Using the metaphor of breathing, this book explores the relationship between feeling safe and feeling in danger. Images of sharp, piercing objects on the outside contrast with the glittering fresh air of the seashore on the inside. The flaps on the outside reveal devices to help you breathe when you're in trouble; on the inside, a heart and lungs work together in harmony. The action of holding the book mimics breathing." Milton, Massachusetts: Teresa Shields, 2001. Edition of 100. 6 x 8.5"; 72 pages. Photo montage: maps, photos, childhood drawings. Spiral bound at top. Signed and numbered by the artist. Two stories about finding one's way home. Read through the book one time then turn the book over to begin the second story. Teresa Shields graduated from Carnegie-Mellon University in 1984 with a BFA in Fiber Arts. She went on to study at Mass College of Art and earned an MFA degree in 1991. She is the sole proprietor of Magenta Cat Productions. She is a member of MamaCita, a mothers' cooperative in the Arts. Falmouth, Maine. Deborah Klotz Paris, [n.d.]. No indication of limitation. 7.5 x 6" paper sculpture book. 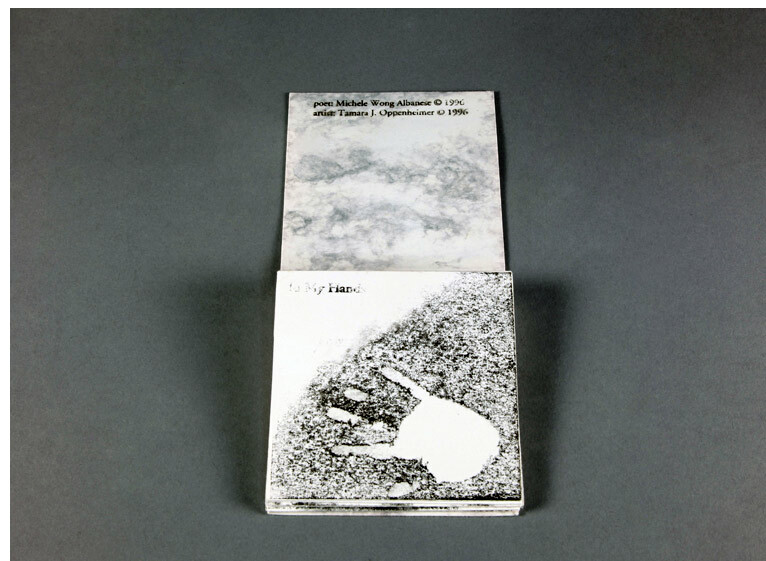 Deborah Klotz Paris teaches papermaking and sculpture at Massachusetts College of Art and Maine College of Art. Malden, Massachusetts: Stephanie Mahan Stigliano, 2001. 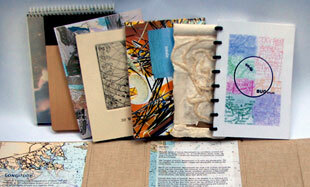 5.5 x 8"; 30 pages including covers. Digital printing. Bound with 8 plastic black rings. Using five longitudes Stigliano looks at insects in several places around the world. Stigliano is a faculty member of the Walnut Hill School of the Arts in Natick, MA. From 2001 to 2010, she was a member of the Visual Arts Department at Pine Manor College, Chestnut Hill, MA. Massachusetts: Janine Wong, [n.d.]. Edition of 40. 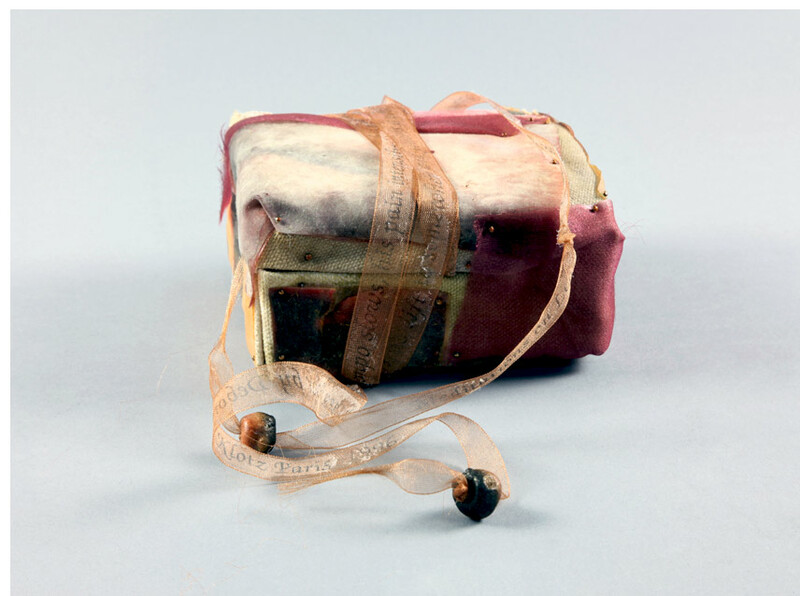 8 x 6" wooden clamshell box containing 3 items: 7.5 x 5.5" text of 8 vellum paper leaves; 7.5 x 5.5" shaped two-page etching on handmade Hay paper; 4.5 x 2.25" double-sided tag. Text laser printed on UV/Ultra. Image printed from a polymer plate. An artistic look at Knowth, County Meath, Ireland (53.43N - 6.21W) through longitude and history - 2000 AD vs. 3000 BC. Wong is Professor of Design at College of Visual and Performing Arts at the University of Massachusetts, Dartmouth. Janine Wong, artist statement: "My work is an organic process. When I gather together ideas and visual elements in advance and set the creative process in motion through layering, collage and the juxtaposition of image and text. Books are created by using prints, test pulls and residual ink prints as foundations for book pages."